You'll find as you're making these blocks that you have some fun triangles left over. 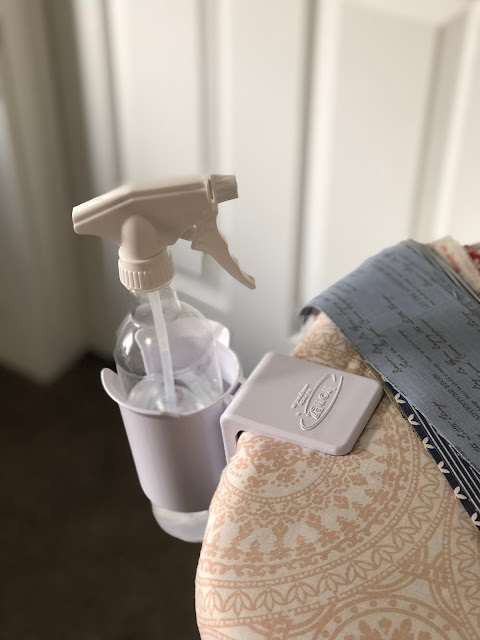 So I've got an idea! 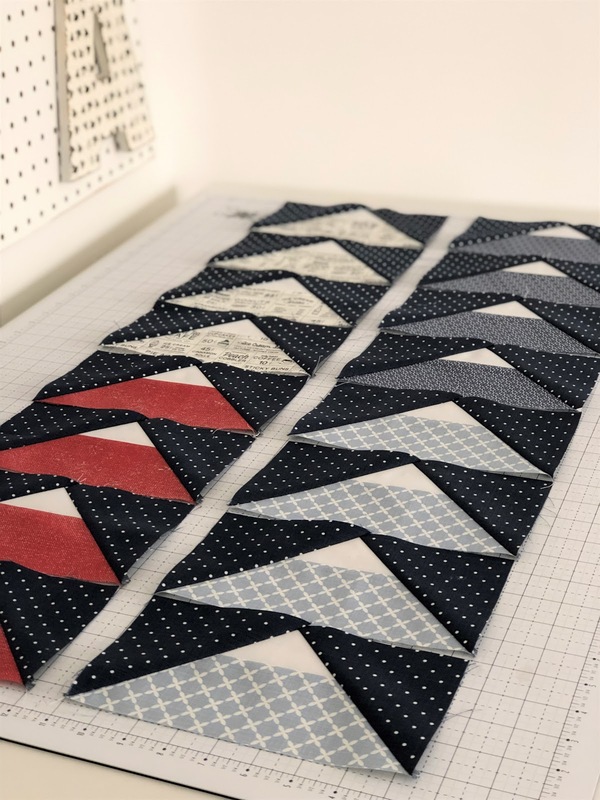 Instead of just discarding the leftover triangles, why not use them to make some other blocks!?! 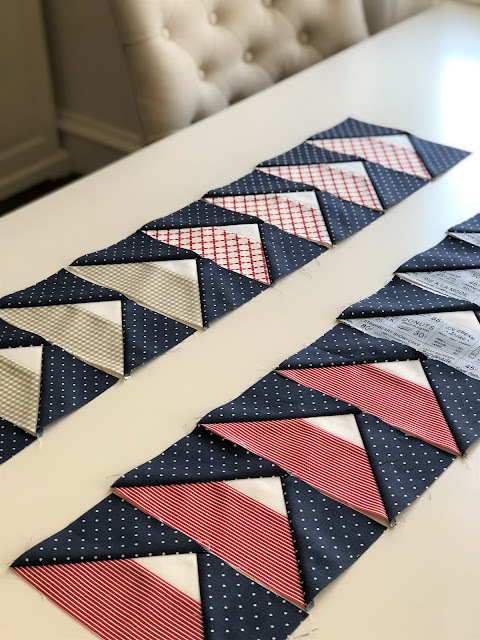 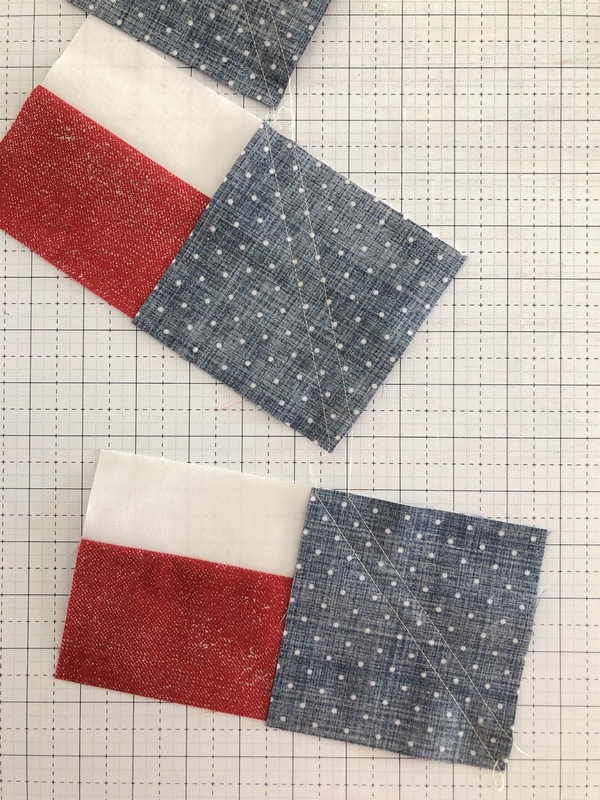 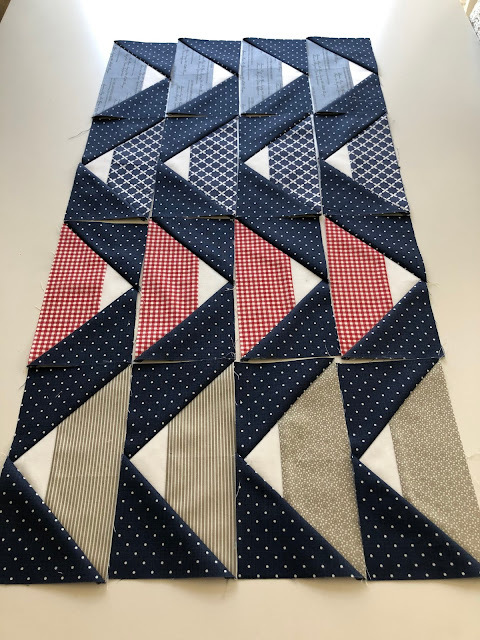 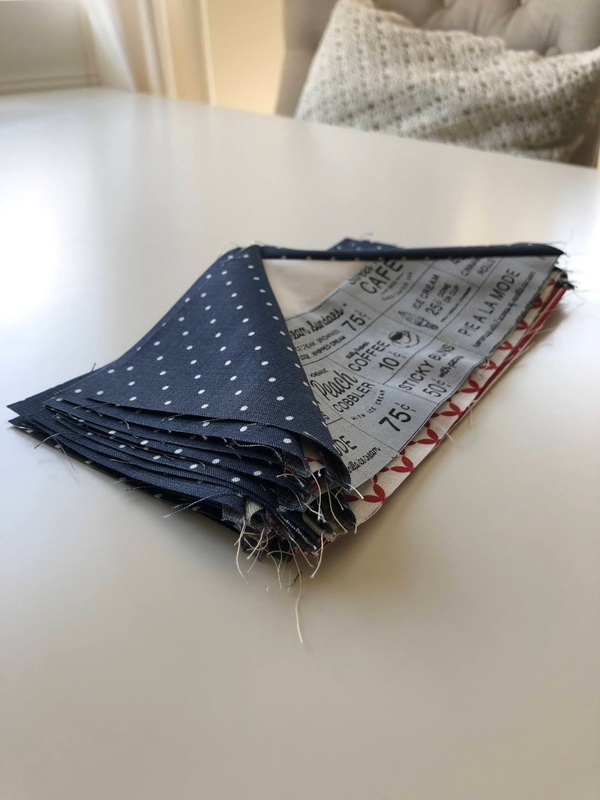 The easiest way to do this is after you sew your squares onto your strip segments (and before you trim them) sew one more seam 1/2" away from the first as shown below. The first seam (for the Skipper blocks) is the seam that goes from corner to corner. 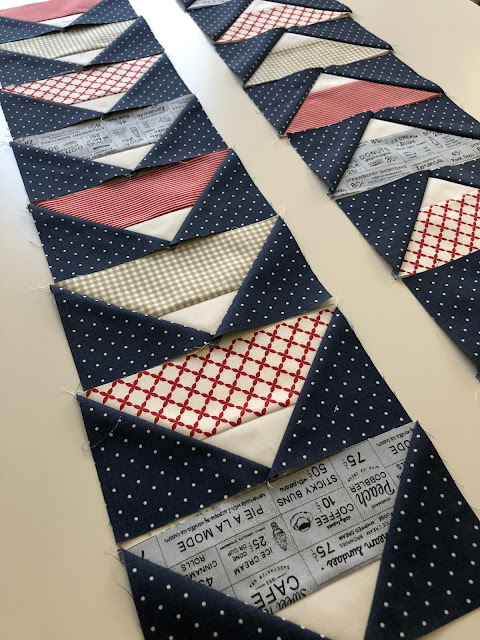 The second seam (for the other blocks) is the shorter seam that is closer to the outer corner of the block. 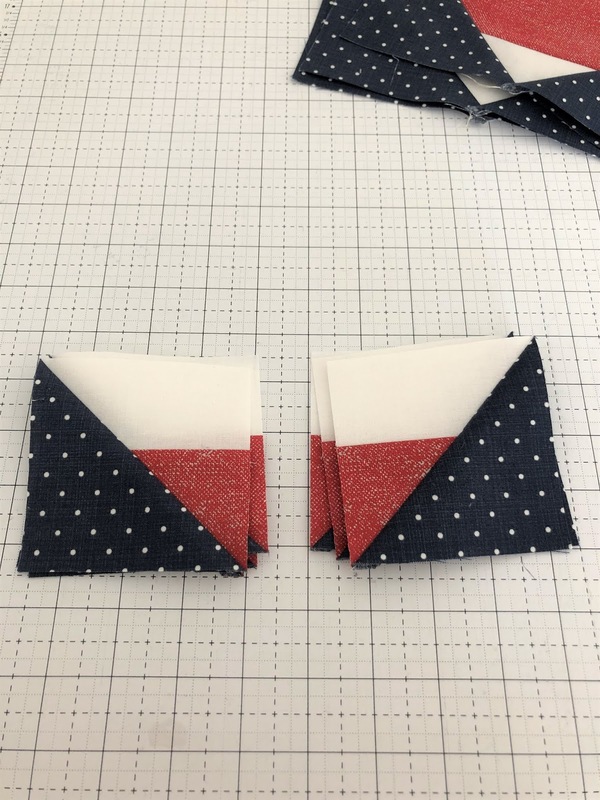 Then cut between the two seams leaving about a 1/4" seam allowance on each block. 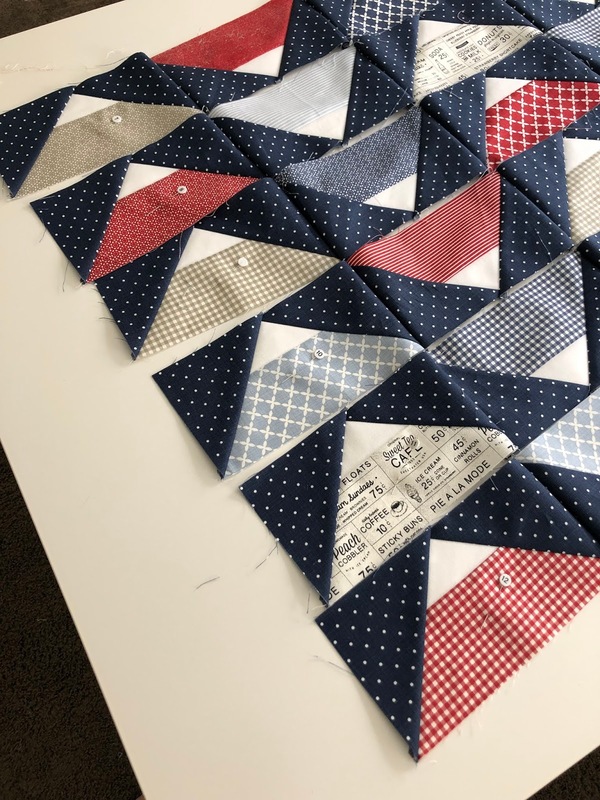 block (Half Square Triangle or HST) seams towards the bigger triangle. Repeat on both ends of all the blocks and then trim the HST's to 3 3/4" each. 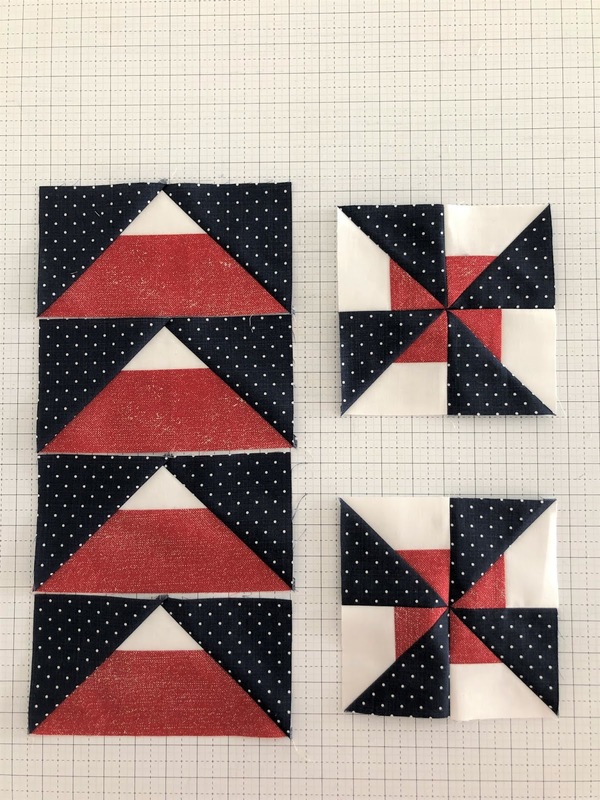 Sew together 4 HST's to make 1 Pinwheel block. 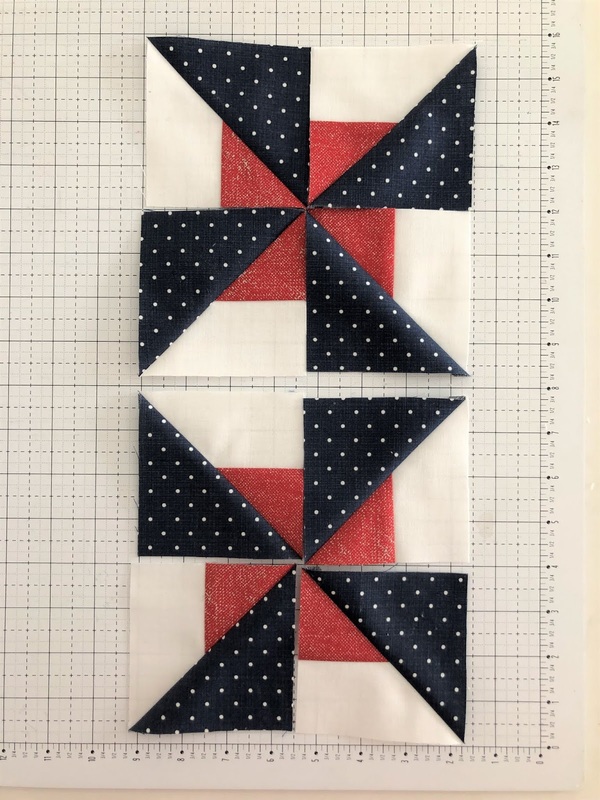 You'll get 2 Pinwheel blocks from each set of 4 Skipper Blocks. 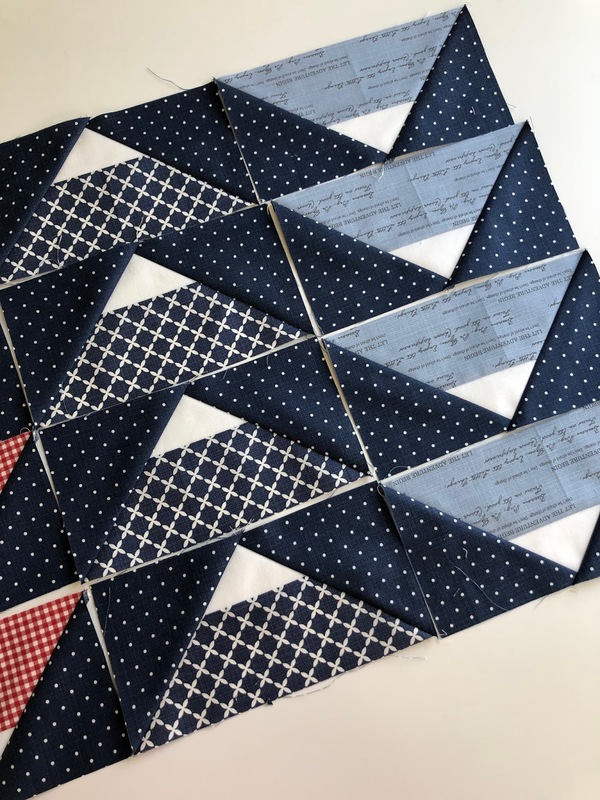 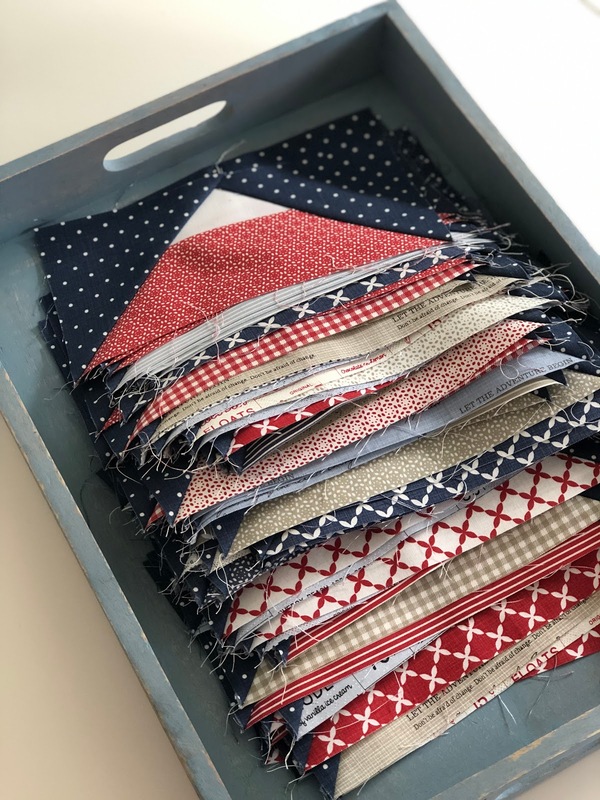 The pinwheels will be going in opposite directions but they would be cute to mix together in a quilt or to break up into a couple of table runners! 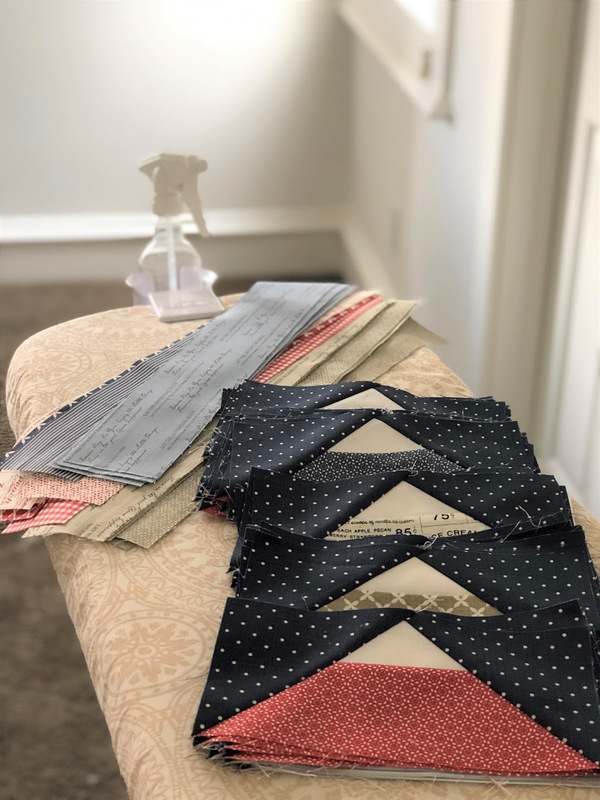 Of course, if you don't want to deal with a second project, disregard these instructions and just move forward using the Skipper instructions! 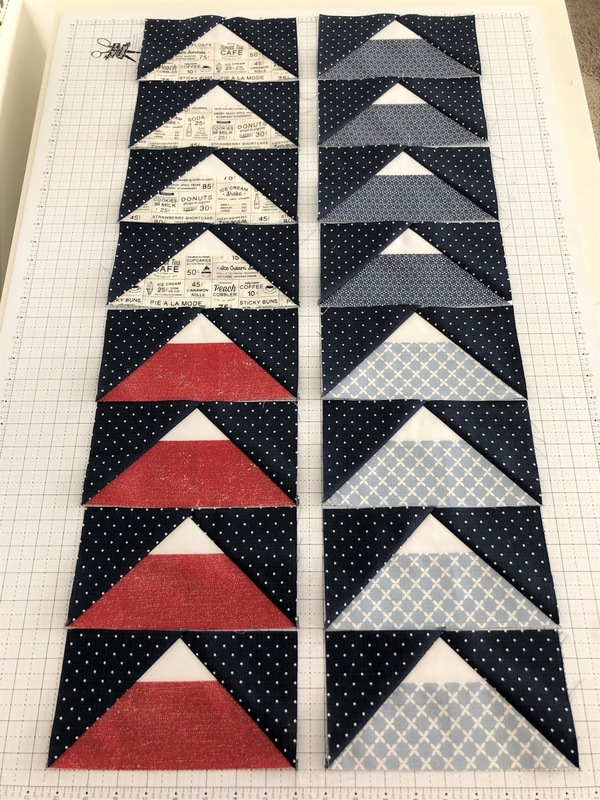 Have fun making these blocks and be sure to post a picture of your first set on Instagram using the hashtag #skipperqal. 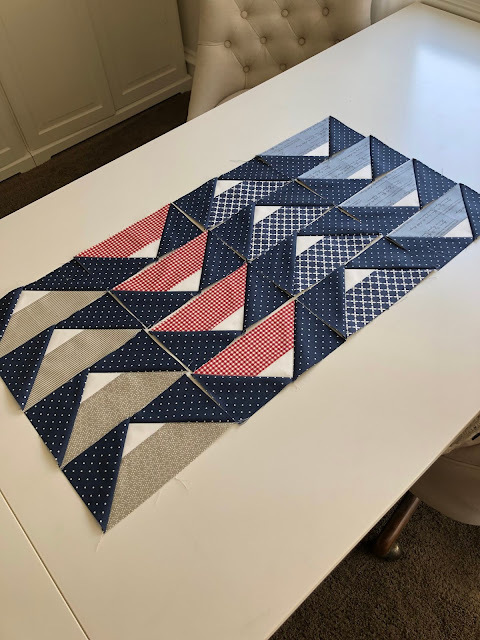 I can't wait to see your blocks!!! 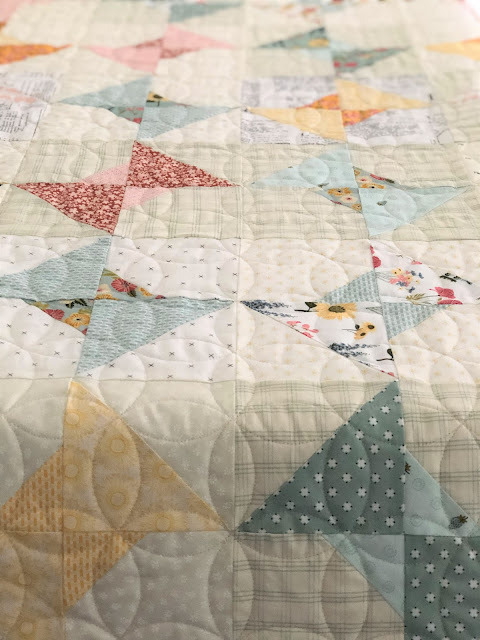 I personally am kind of obsessed with the light blues in this line. 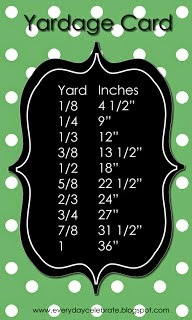 [Note: the pattern calls for 1/8 yard cuts for the bright fabrics. 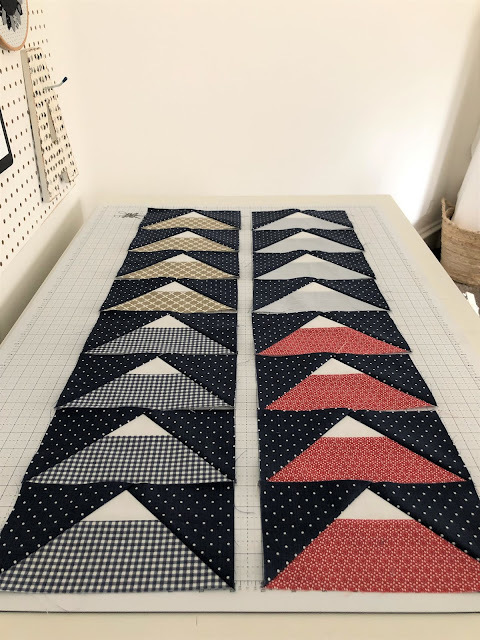 Goal #3: Do all the cutting for your chosen quilt size. 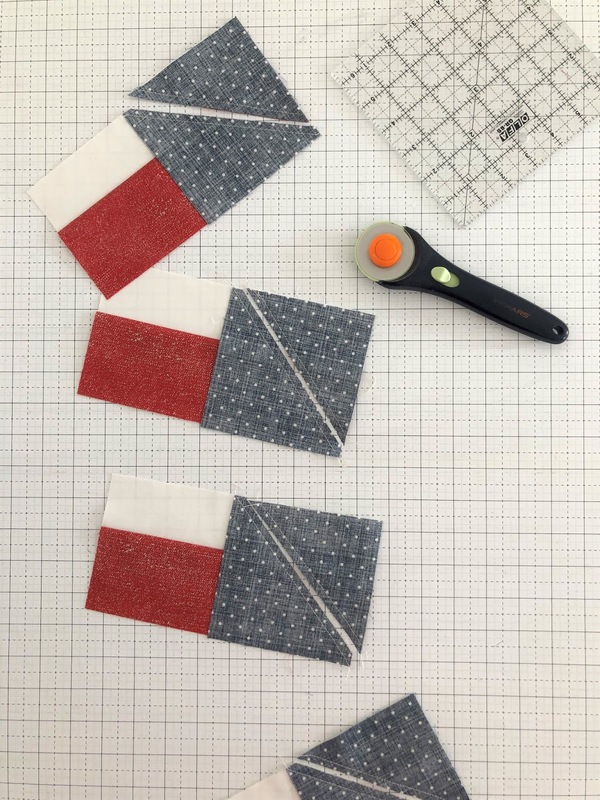 Press your beautiful fabrics (if necessary) and begin cutting. 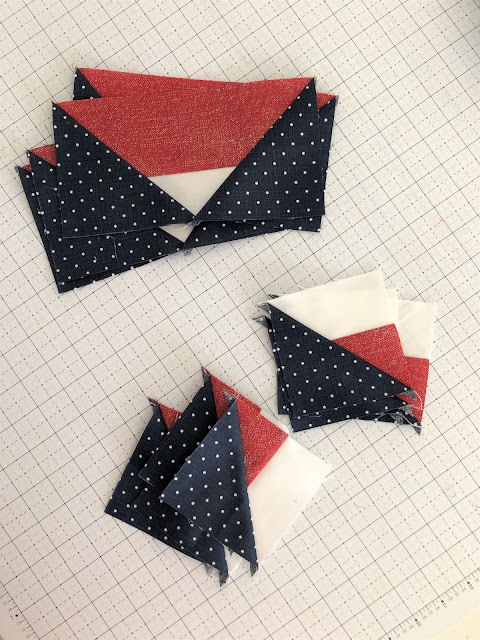 I think you will find my Quick Rotary Cutting Tutorial very helpful. 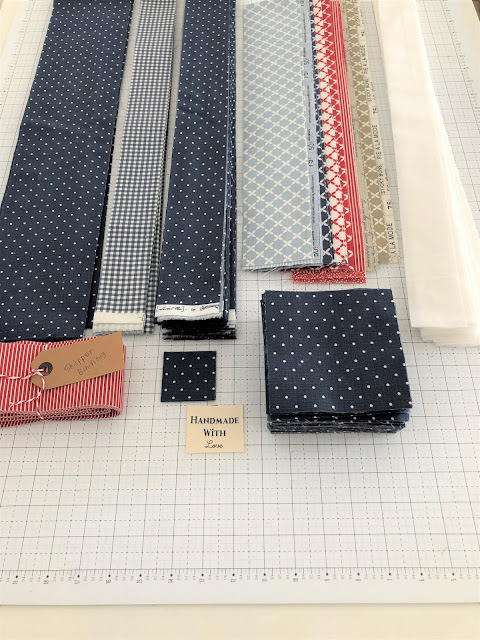 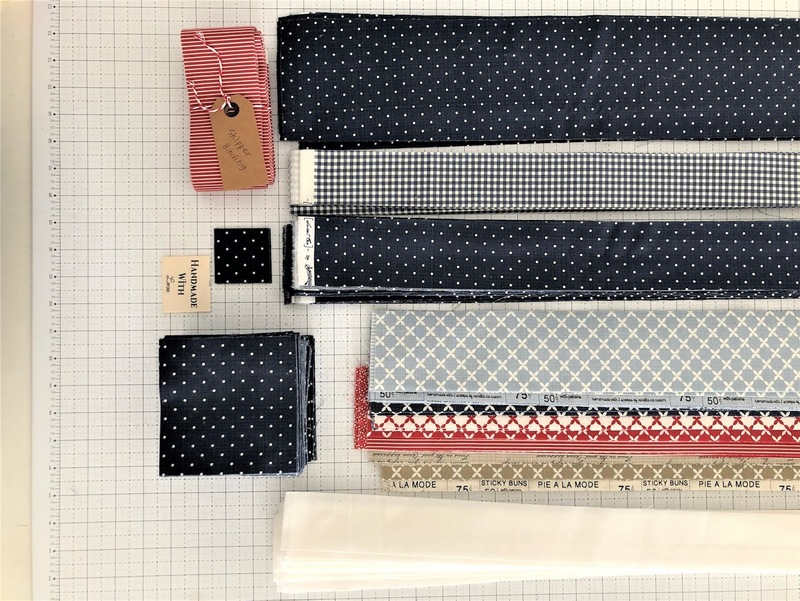 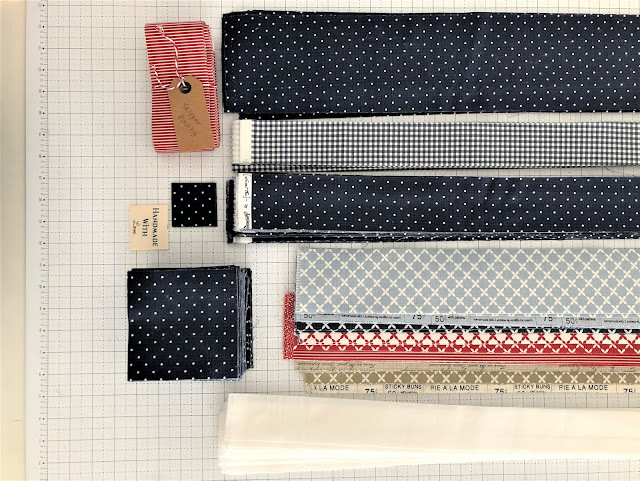 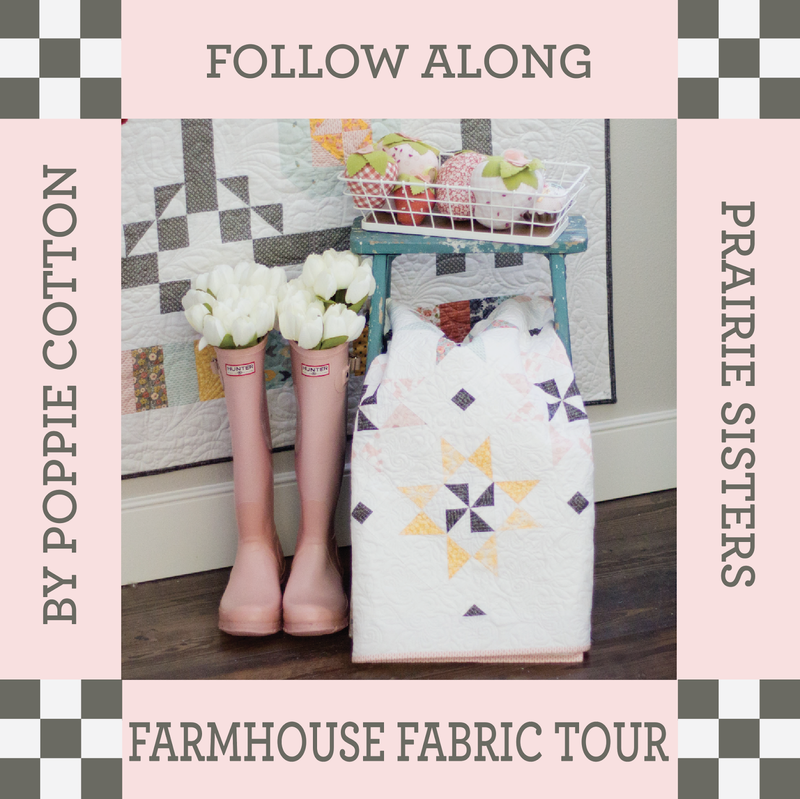 Be sure to post on Instagram this week a picture of your fabric selection and cuts. 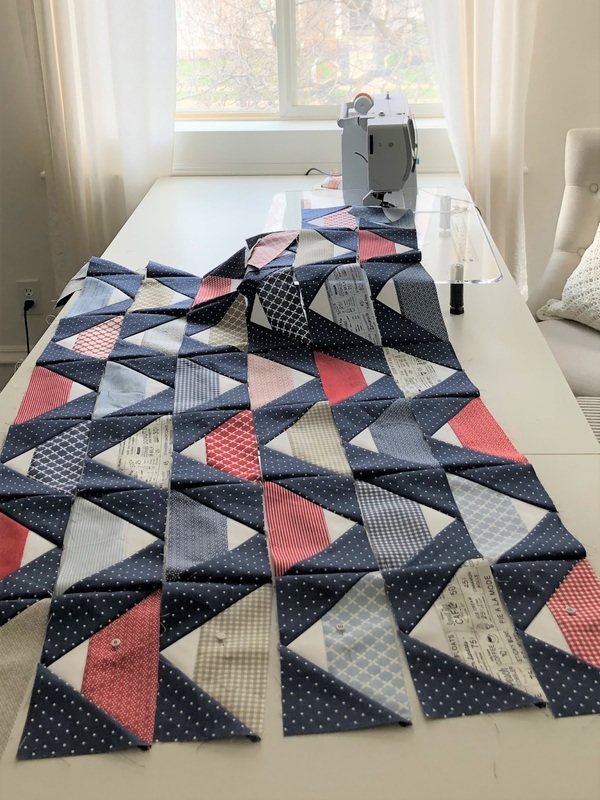 Use the hashtag #skipperqal so we can all see what you're working on. 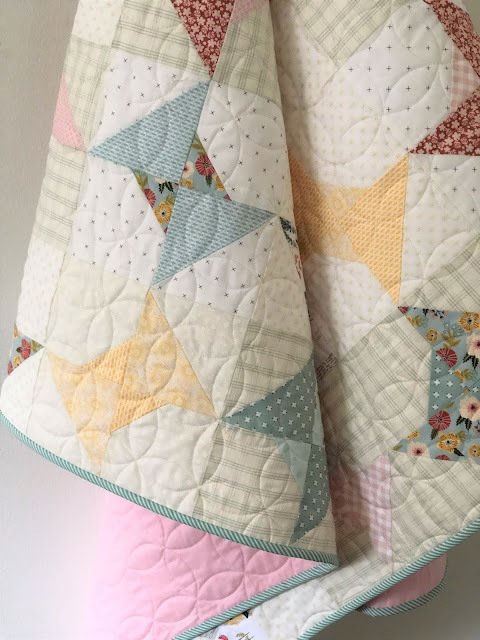 Although we're not having weekly prizes in this Quilt Along, I think a little accountability goes a long way! 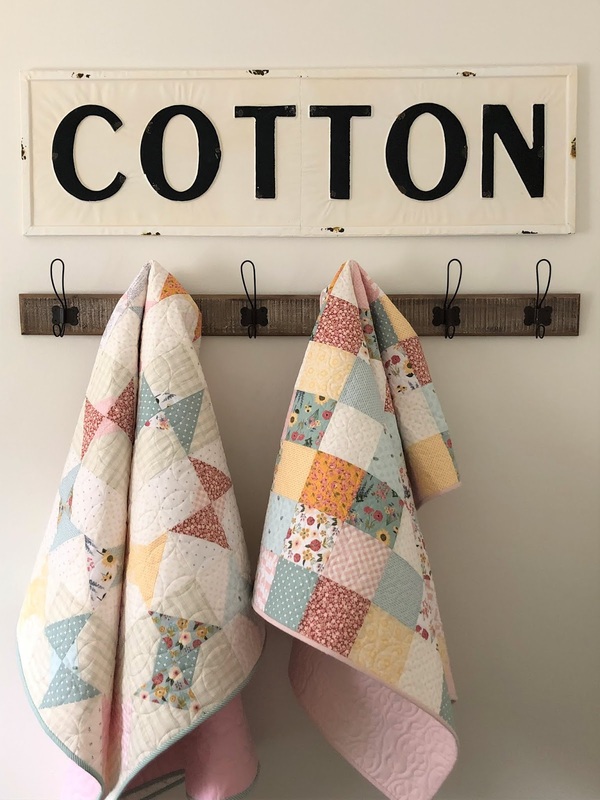 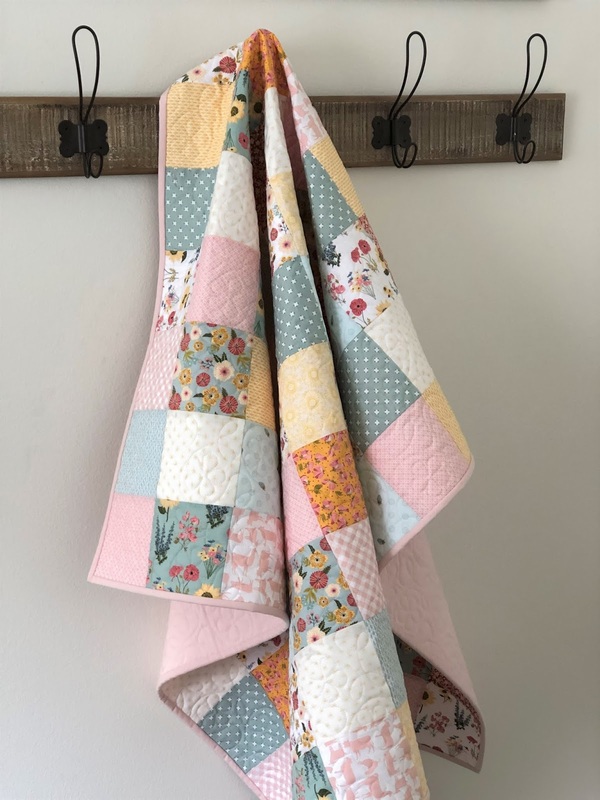 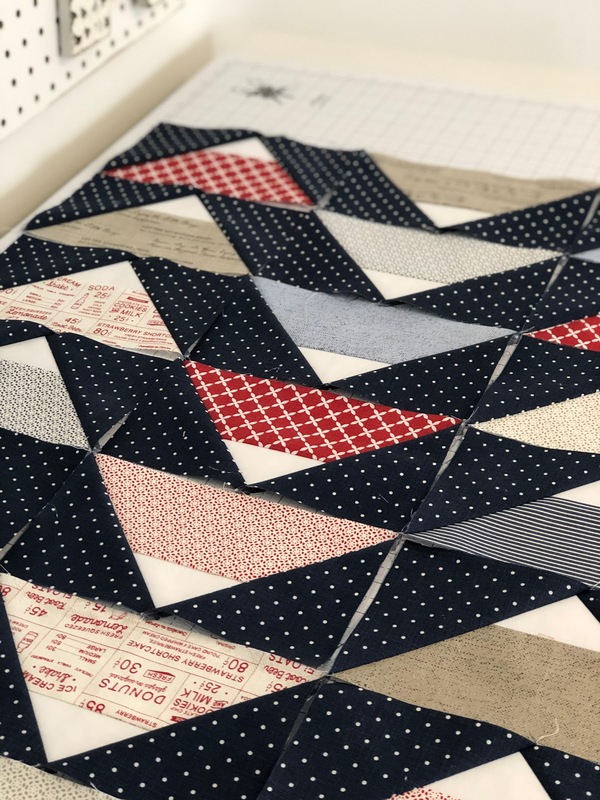 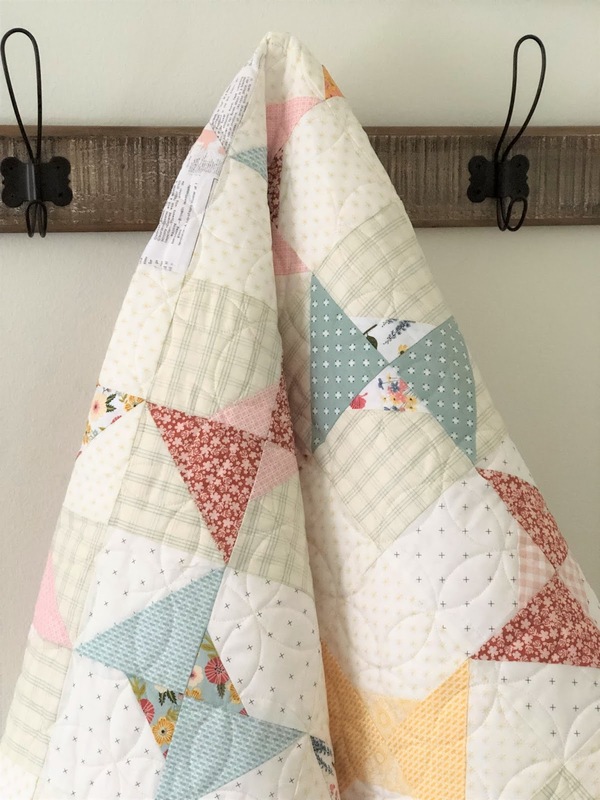 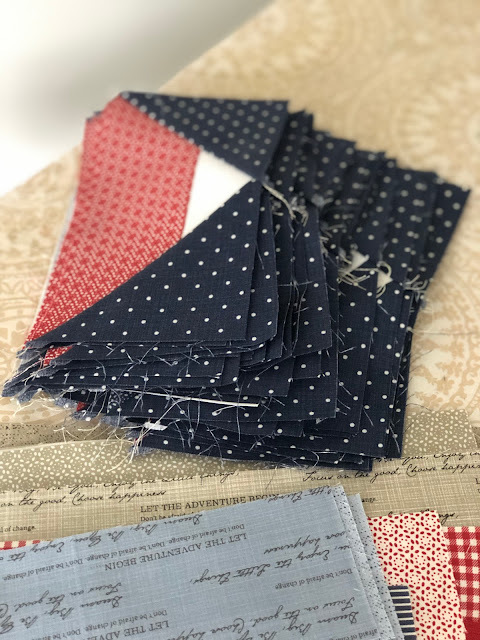 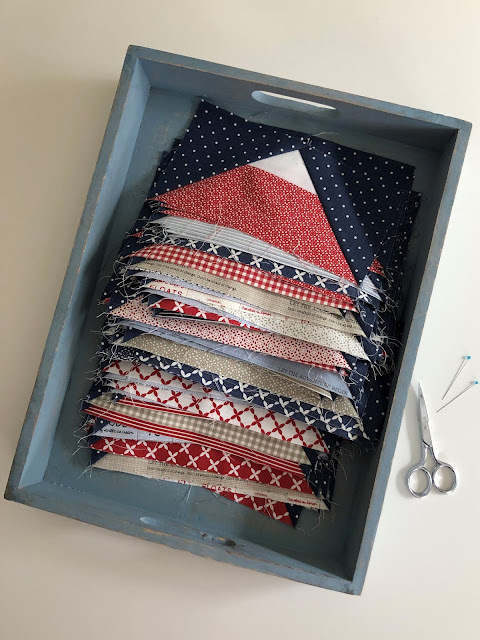 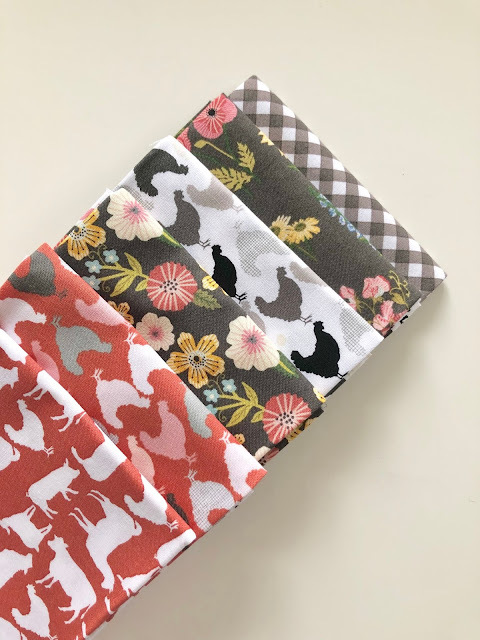 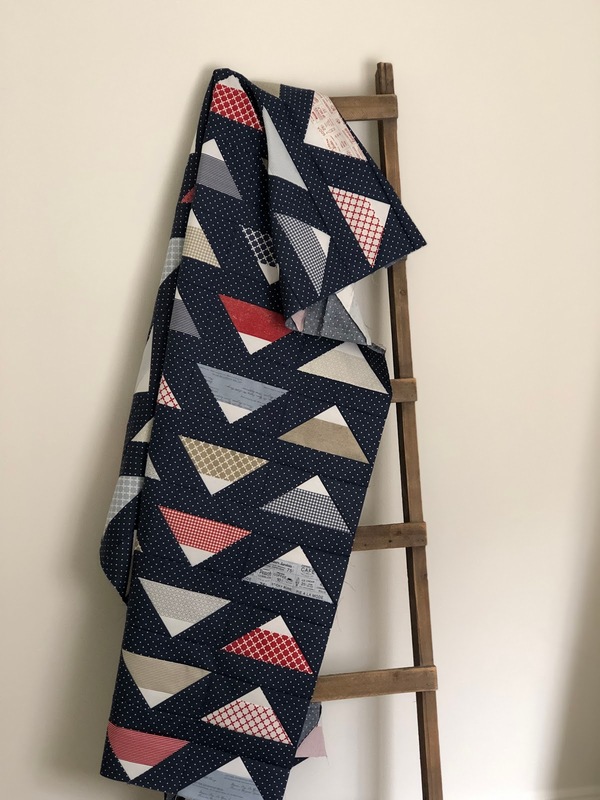 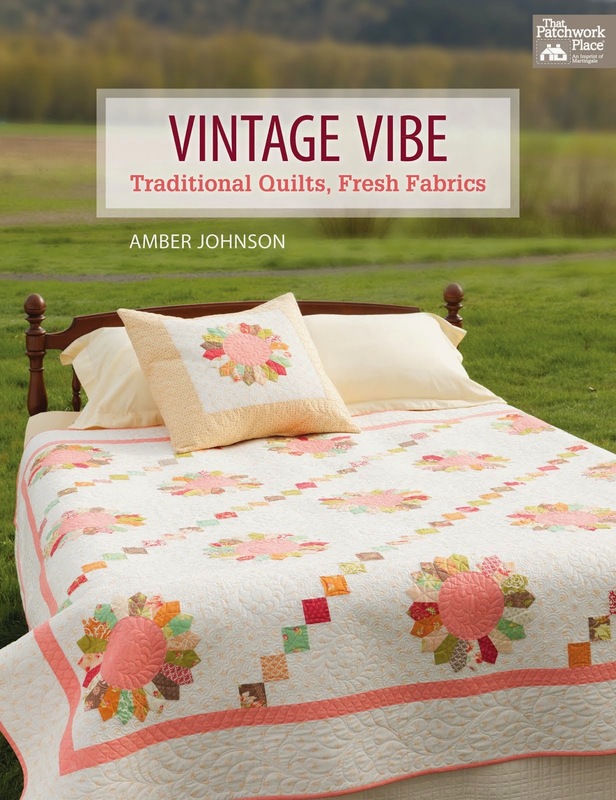 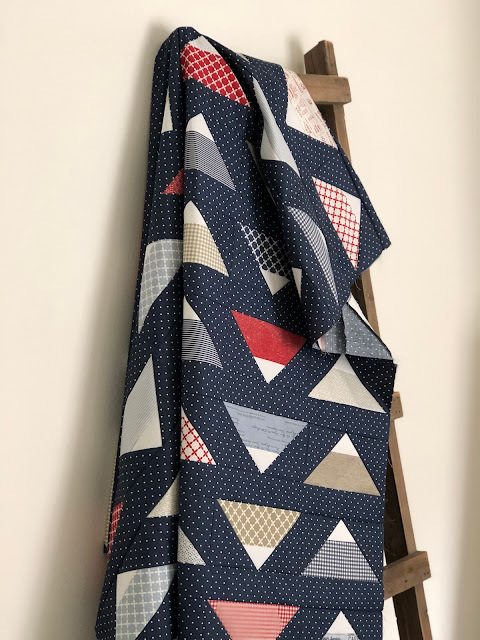 If you stay caught up and are able to post a picture of your finished quilt top by April 28th you'll be entered to win the GRAND PRIZE - longarm quilting by One Sweet Bee Designs (@onesweetbeequilts on Instagram)! 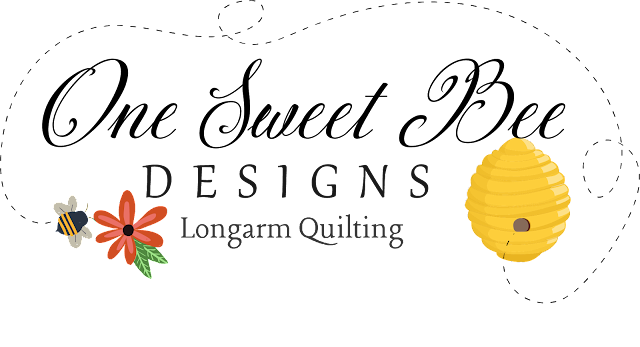 In my opinion, one of the best things about Quilt Alongs is the opportunity to make new quilty friends, encourage each other, inspire and be inspired by others! 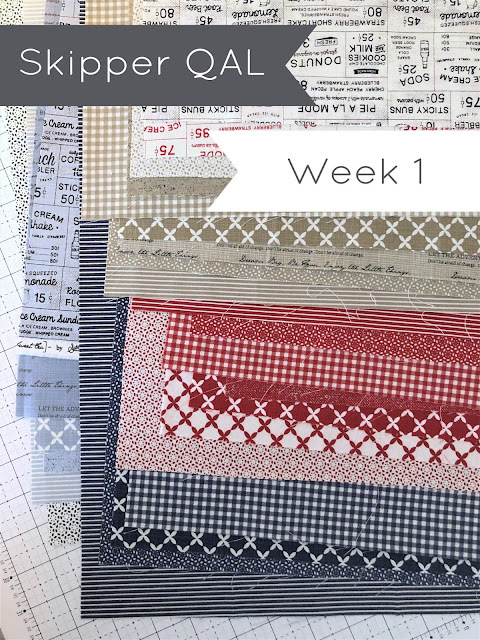 I hope you'll take a few minutes each week to peruse the hashtag and leave a few comments! Before I let you go, I want to thank each and every one of you for being here. 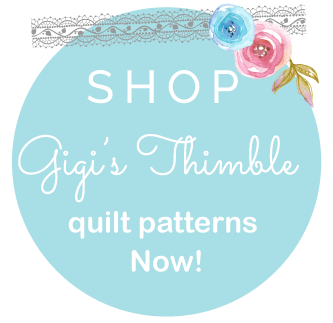 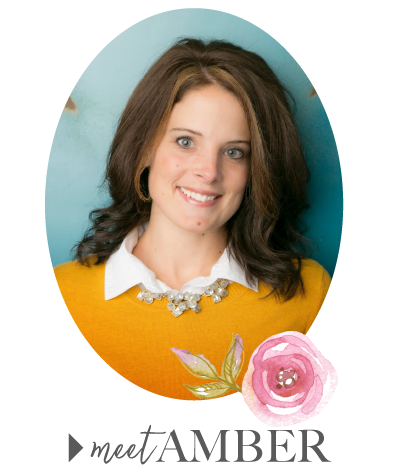 Thank you for purchasing my pattern and thank you for coming along on this ride! 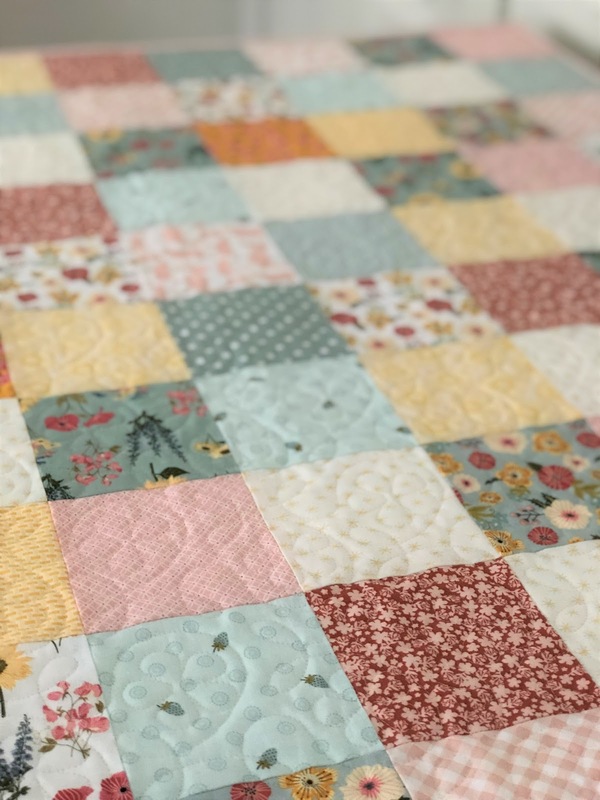 Quilting is so much more fun with friends!